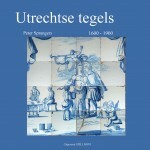 Utrecht tiles, 1600 – 1900 is a study by Peter Sprangers into 300 years production of wall tiles in Utrecht from 1600 till 1900. The price of the book is € 24,95. Till the 15th of september 2013 there is a special introductionprice of € 22,50. The websiteshop gives the price of posting in the Netherlands. Please send us an e-mail so we can inform you about the postalcosts to your country.